cumulating more than 20,000 monitored vehicles. We are based in Romania and we want to extend our services throughout Europe. We design ourselves the solution we propose and we are willing to adapt them to our Clients needs. Nexus Locator is a tracking Android app that converts any smartphone into a tracking device, so you can constantly keep in touch with your people in the field. 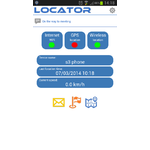 Turn any smartphone into a GPS Tracker and make it easy for your organization to track everybody's activity. The mobile phone uses the GPS antenna and Wireless networks for localization, then sends the data via 3G or WiFi networks. It doesn't require for the phone to have an active internet connection as it can send all the data when the first WiFi connection is available, making it a cost efficient tool for your company. We are searching for companies that are using field workforce, with the need of managing it easy from a web based interface. We are also looking for distributors for our solutions. We can support our Partners in order to reach success together.